Im sure many of you sat down last night to witness one of the most candid interviews of the year. 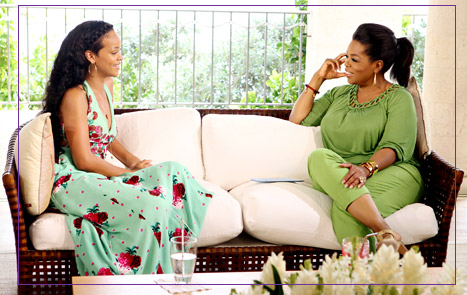 Rihanna sat with Oprah and spoke about her career, life, and love. Fans got to witness Rih as many never had. Oprah reminded some of us and informed many of the impressive career the pop star has had at just 24. Rihanna spoke freely about her relationship with Chris Brown as tears filled her eyes. At the end of it all, her hope for him is that he's at peace and happy. She explained that they love each other and arent trying to change that, and if you've ever been in love you know they couldnt if they wanted to. Rihanna also confirmed rumors that the two spent time together while in St. Tropez-admitting that she still gets butterflies when she sees him, but she understands that will always happen. Her honesty was brilliant last night. I remember her in the Diane Sawyer interview, how distant and shielded she seemed. As she explained to Oprah last night, the burden of unforgiveness was heavy and made her hard and closed off. In trying to releive herself of that burden she first had to repair her relationship with her father she explained. Once that was back in order and she was able to forgive him for tearing their family apart, she says she was then able to fully forgive Chris. The lessons that were taught between Rihanna and Oprah last night were everything! There was an underlying theme of forgiveness, love, and strength. When asked about the current status of their relationship, she simply replied that they are great friends. She explained that he is in a relationship of his own, and that she is single, but that they do love one another deeeply. The moment that revealed that the most for me occurred when Rihanna explained how her love for him doesn't mean the have to be together.. but it does mean she wants to see him happy & at peace. The interview was just amazing! Oprah took Rihanna off of the pedestal the world has put her on and gave her a platform to just be Robyn for a minute. It was lovely. According to a tweet saved by Rih last night- Oprah has said she is thinking of asking Chris to appear on her show. We all remember how angry Oprah was over the altercation, and I was encouraged by her ability to discuss it with Rihanna last night without being judgmental. Many people expressed over twitter that the interview changed their perception, feelings towards, or understanding of Rihanna and even of Chris Brown..which I thought was powerful. Rih also surprised her mom with a dream house and Mama Fenty kept repeating- "Oprah's my first guest!!" It was beautiful! IF you missed it you can check the full interview HERE! Also below are a few extra clips that didnt make the final cut of the show!! Rihanna speaks about her epic twitter account, her tattoos, and what it's like to miss Chris. Overall.. I wish them both the best that God has to offer them. I got an email just last night full of statistics from someone who feels Rihanna is making a mistake by forgiving Chris. To that I simply reply- forgiveness in and of itself is never a mistake. Also- Im a 26 yr old single black woman in America.. according to statistics I should be HIV positive and have 5 kids by now.. there ARE always exceptions. Rihanna shows Oprah her new tattoos. What's the meaning behind the Egyptian falcon on her right ankle? Watch and find out! After reading some of Rihanna's tweets—which go out to more than 24 million followers—Oprah says she noticed that this pop star has a fondness for the f-word. Watch as Rihanna explains her Twitter philosophy...and why she encourages fans to read between the lines. i must admit i see her in a different way. wasnt a fan at all before but now i think i like her as a person. I AGREE 100% ABOUT STATISTICS! IF THATS PEOPLE ONLY DEFENSE AS TO WHY THEY SHOULDNT BE TOGETHER IF THEY WANT AND ARE BOTH MATURED THEN THEY NEED HELP. THEY WERE KIDS THEY VERY WELL CAN WORK NOW. I love Rihanna for this reason. She is so revealing and doesnt hide behind the industry facade that most celebs hide behind.